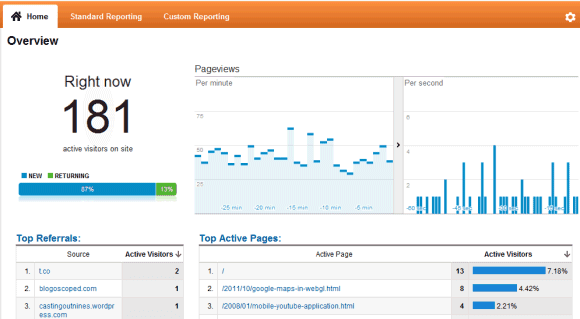 Two weeks ago, Google Analytics launched real-time stats. This feature is not enabled for everyone yet, but you can request an invitation using this form. After receiving the invitation, you need to switch to the new Analytics interface, select a site, go to the "Home" tab and click "Real-Time (Beta) / Overview". I must say that this feature is addictive because it shows a lot of information about your site in real-time. You can find the number of active visitors, the number of pageviews, the top referrals and the top active pages. There's also a map that highlights the cities where your visitors are coming from. And all this information is updated so frequently that it's difficult to keep up with the ever changing stats. Google Analytics is great for the intuitive reports and the advanced filters that help you understand traffic fluctuations, but a lot of people will use the service more often because of the real-time stats. They're constantly changing, they're mesmerizing and empowering. Asking for an invitation lets see if they accept me or not. This would be very interesting to use when it goes live on full scale. Feeling my visitors real time - thinking of it is also exciting. I can understand the behavior of the users on my website in a much better way now. i had send my info on the link form you have put... but Google analytic in real time still not exist in my account... am i doing something wrong or just it need more time for them to review ...? Non-technical mangers would appreciate this info. yes finally i had the real time stats.. :-) kudos for this post man.. This new feature is very addictive. Does anyone know what the colours of the circles in the location map mean? As well as light pink, I sometimes see circles pop up in dark pink or green. I am also curious about the meaning of the coloured circles. Anyone? @Bill, @Chris The red/green circles show new/returning visitors respectively. I kinda really like using google analytics on my sites, it provides excellent feedback and shows me areas where I can improve my website. Somebody should create standalone widget/app for this! Somebody should create a standalone widget/app for this, just displaying the current number of visitors. Perfect little app waiting to be made! To be honest, the only thing I use on my sites is Google Analytics, it gives me awesome insights. Real-time statistics are good. If you have a website, you probably want to be up to date. You want to know what's happening right now. You don't want to wait and check your GA stats of yesterday. Thanks Google!